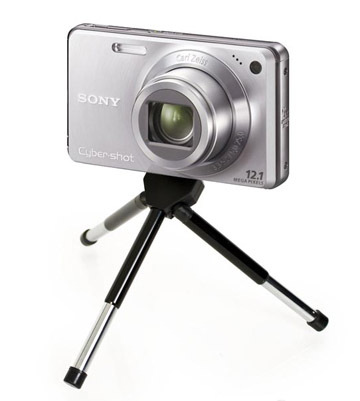 Do you want to get a small digital camera tripod but don't know where to start? Are you looking for something that is versatile, super easy to carry, and won't cost you a bundle. Whether you want a small tripod for your cell phone or for digital camera, this post will help you choose. "The battle of compact tripods"
Four unique designs battling to the bitter end. Different features and prices make for fascinating assaults. Guaranteed bloodshed is sure to emanate from this aggressive conflict of tripods for compact cameras. Tremendously tantalizing and sure to produce a sequel. This article will help you figure it all out. Welcome to the battle of the small digital camera tripods. The good news is that you have plenty of options that don't involve you spending a lot of your money. Tripods for small digital cameras come in four main types and they're all quite a bit more affordable that full-sized tripods and they are certainly a lot easier to carry. There are variations of each, but if you think in terms of these 4 types, it will be simple for you to choose the best type of small tripod for your situation. 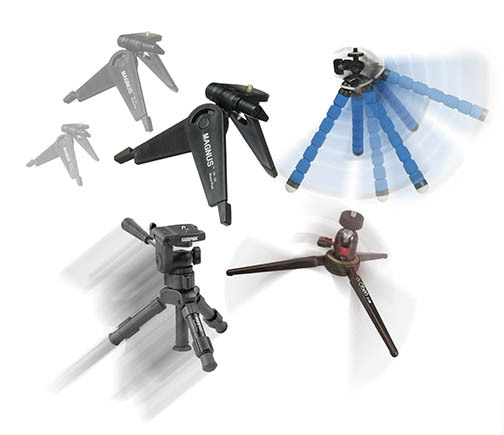 The types of tripods for small cameras are either pocketable, intended for tabletop, compact versions of regular sized tripods, or have bendable legs. The maximum tripod height is very limited for all of these, but that comes with the territory when you are buying real small tripods. They are all compact, light, and easy to transport. I chose the Sunpak MiniPro and I love it. I only use it in a few situations, like photo hiking trips, outdoor and tabletop macro photography. There are pluses and minuses to each of the four small camera tripods mentioned. Here is a simple rundown of each kind of tripod. 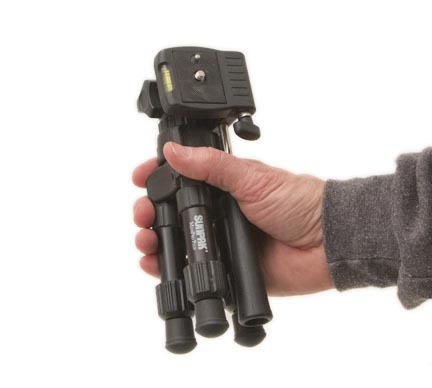 Easily the runt of the litter, the pocket tripod is like a pen knife. 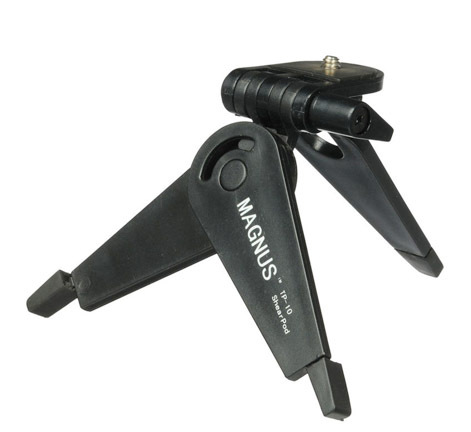 It folds down into a really small size and conveniently slips into any small pocket you have available. They are surprisingly quite rigid and very stable due to the angular, scissor-like leg design. They're best suited for small point and shoot cameras, a GoPro, or a smartphone with an adapter. You really could use this type of compact tripod for a DSLR if you are only taking photos with your camera in a horizontal position. This particular model swivels into position without a locking mechanism, so it does have limitations. 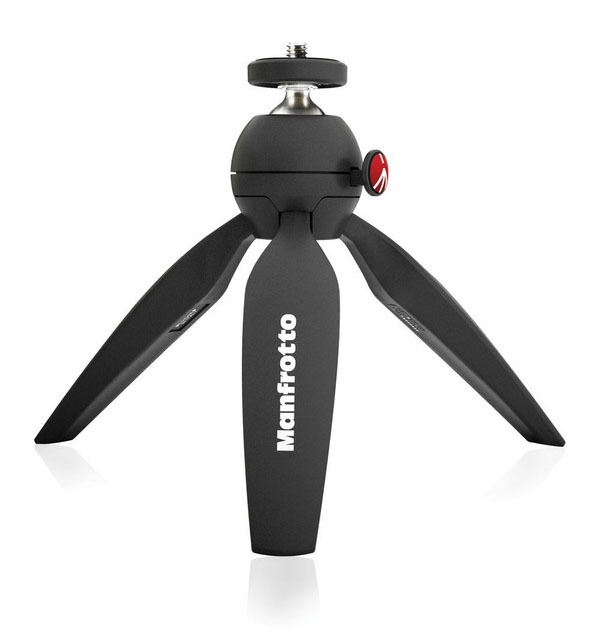 This small digital camera tripod type is great for anyone who wants to go ultra light and ultra portable. Backpackers love accessories that are super light and super small. 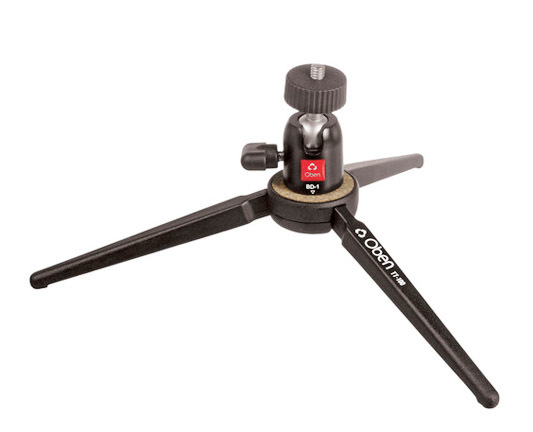 The tabletop tripod design with the wide leg spread is a safe and stable design. These work very well with DSLRs. This design comes in many sizes. 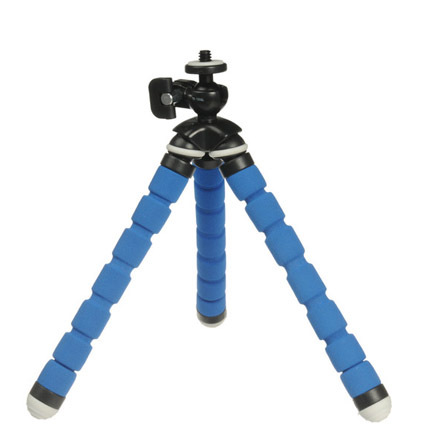 You get the most stability with this type of small tripod because the legs spread so wide and there is no center post. There are variations that stand as high as 12 inches but the legs don't stand as wide and are not as stable as the design shown in the photo. The small ball head is small and light, but it can be challenging to make small adjustments in your composition, particularly with larger/heavier cameras. 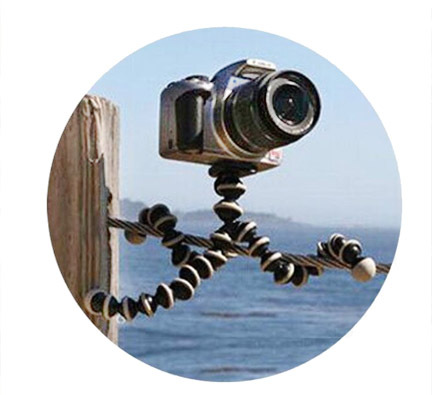 Mini tripods behave most similarly to traditional tripods. This is the design I prefer for the types of photography situations that I encounter. They have adjustable telescoping legs and a center column for additional height adjustment. You must use them with caution because they have the most top heavy design. You can get the pan and tilt head that can also rotate your camera for vertical (portrait) shooting or you can buy these with a ball head. That's what I like about my mini tripod; it behaves like a traditional tripod with tilt, swivel, and pan movement, albeit on really short tripod legs. The flexible legged compact tripods remind me of a children's toy. They are a lot of fun to play with in a variety of ways. They have very limited use with bigger digital cameras. 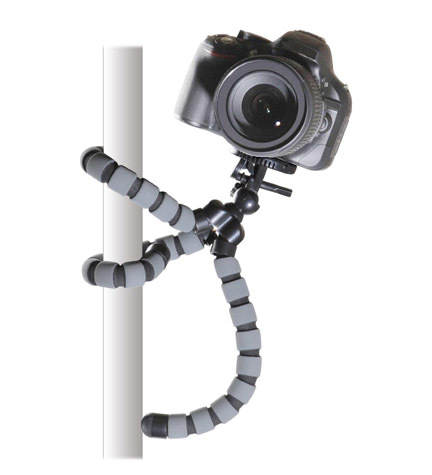 It's not that they can't be useful-they are the most popular for iphones and GoPro cameras. They're for the photographers who shoot in a wide range of places and situations. In fact there are certain unique situations where this type of tripod is the only one that would work for you. Look at the three photos below. You can see that the flexible legged tripod uses are only limited by your imagination. 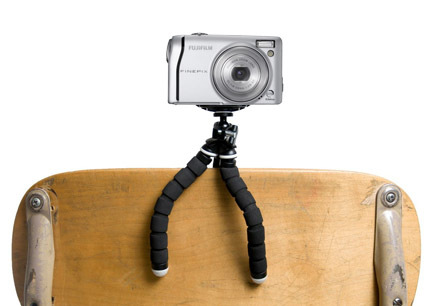 Can you think of any other situations that a small tripod with flexible legs would be needed? The demand for small digital camera tripods has skyrocketed for two reasons. 1. Cameras are getting smaller. You don't need a full-sized DSLR anymore to take breathtaking photos or video. Whether it's your go-pro, your cell phone, a simple point and shoot camera or a compact DSLR, technology has made cameras better AND Smaller. 2. Digital photography is exploding. You, your neighbor, your workmate, and your Uncle Harry have all become photographers. Photography has become an integral part of our society. Twenty years ago traditional photography was a hobby practiced by a few and tripods were not so commonplace. Digital photography and all of the cameras accessories, like camera tripods, are everywhere and people are shooting more photos in record numbers, more than any other time in history. The vendors I recommend are all online. You get great prices, free shipping, and a great source to read reviews. If you do happen to use one of these sellers I get a little financial "thank you" from them for helping you find a good match. It cost you nothing extra and you get your tripod delivered to your door. Here's my resource page. My favorite is the little version of a traditional tripod. Maybe I am just old fashioned. I like the adjust-ability of the legs and center post. The long screwdriver type of handle make it easy for you to make small changes in the composition of your photograph. I own the small tripod pictured below on the left. You'll find the most useful camera tripod reviews by searching on big online retailer sites, by using terms like camera tripods at Walmart, or look up tripods at Best Buy. I use Amazon to read the reviews because the reviews are longer and more in depth than the other retailers. Here are some closing thoughts on small digital camera tripods. You actually can ( using common sense and diligent caution) use a small tripod like one of these for a DSLR if the situation is right. I've used a Canon 5d Mark III, Canon 70D, as well as my compact G1X Mark II on my Sunpak Mini Pro Tripod. 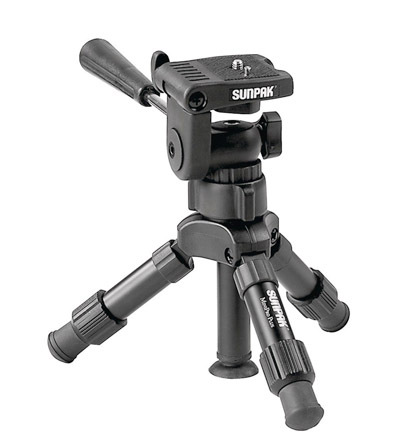 These tripods are really for small digital cameras and they perform better when the cameras are not too heavy. Tripods for small digital cameras are light, easy to carry, and can be used as a travel tripod provided you are aware of their shortcomings.